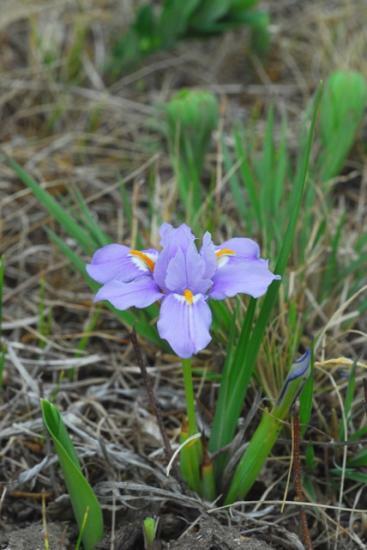 Mathew’s subgenus Limniris are Irises that grow from rhizomes and are beardless. They are native to North America, Africa, Europe and Asia. 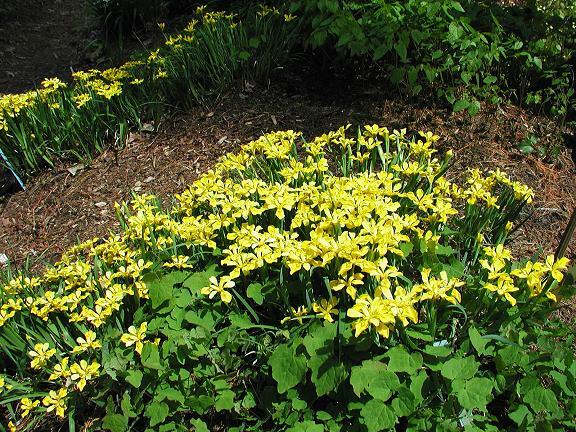 Many of these plants are found in wetlands and some require moist rich soils while others can dry out a little. Mathew has divided this group into two sections. One section is Lophiris or the Crested Irises. The other section is Limniris which includes all the rest. This section is further divided into many sub groupings. 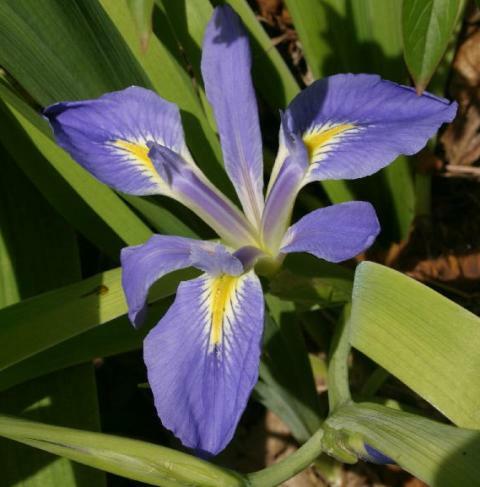 The only subgroup that we have included at this stage on our wiki is Pacific Coast Irises. All the others are listed on this page and other Beardless iris pages wiki pages. Species A-K will be listed on this page. 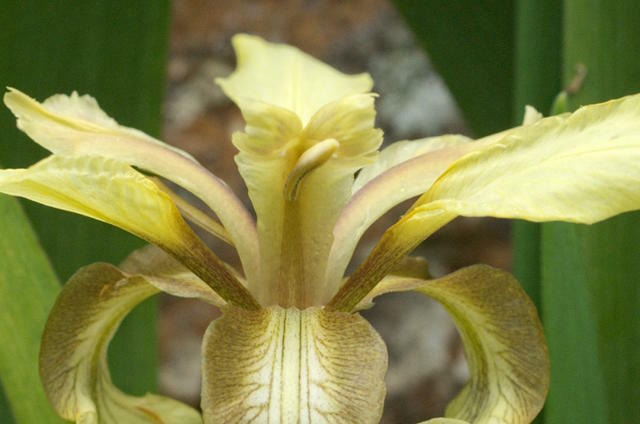 Iris species from all groups are listed alphabetically on the Iris wiki page. 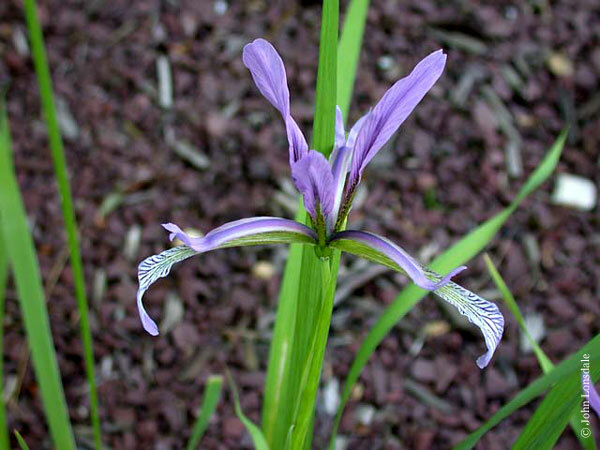 Iris anguifuga from China has violet or blue flowers, spotted purple. Photo by John Lonsdale. 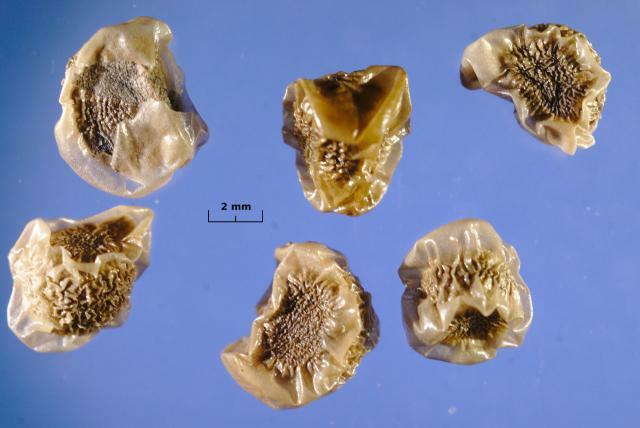 Iris barbatula is a small tuberuos species from Yunnan province. It is about 10 cm with dark violet flowers. Growing in open grassy areas and forest clearings at high elevations. Tends to form small clumps. Photo was taken by Oron Peri in its habitat. Iris brandzae see Iris sintenisii ssp. brandzae. 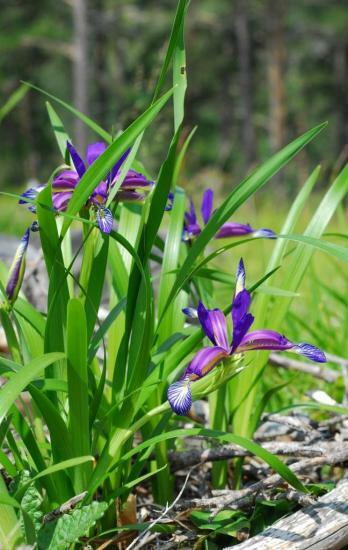 Note: Some databases list this as a subspecies of Iris sintenisii and in other databases it is listed as a species. 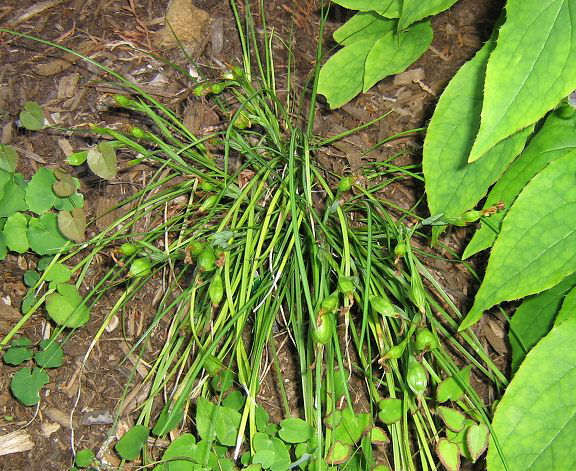 Iris brevicaulis was long known as Iris foliosa. 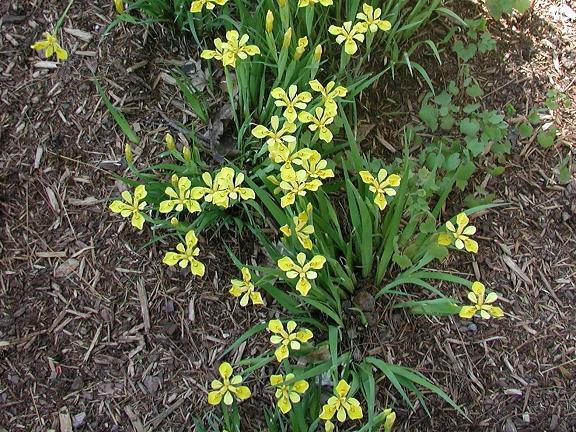 It is one of the so-called Louisiana irises, although this species ranges north into Ohio and west into Kansas. 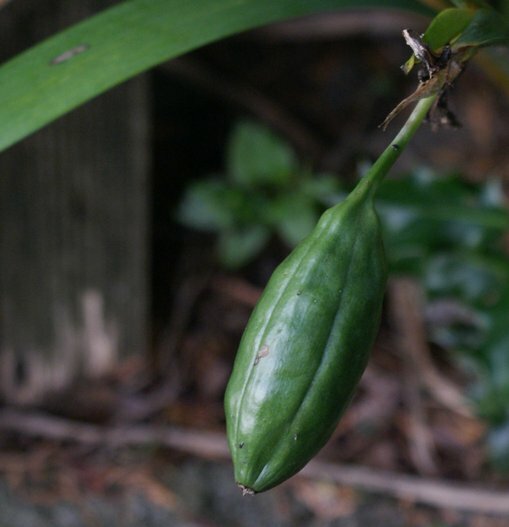 This is a low growing species whose leaves typically are taller than the inflorescence. The inflorescence itself is short and has a sort of zig-zag shape, with a flower at each angle. And because the inflorescence typically leans, the four to five inch flowers are rarely more than a foot above ground. This species is one parent of the now nearly century old hybrid Dorothea K. Williamson. Photographed by and in the garden of Jim McKenney on June 11, 2006. 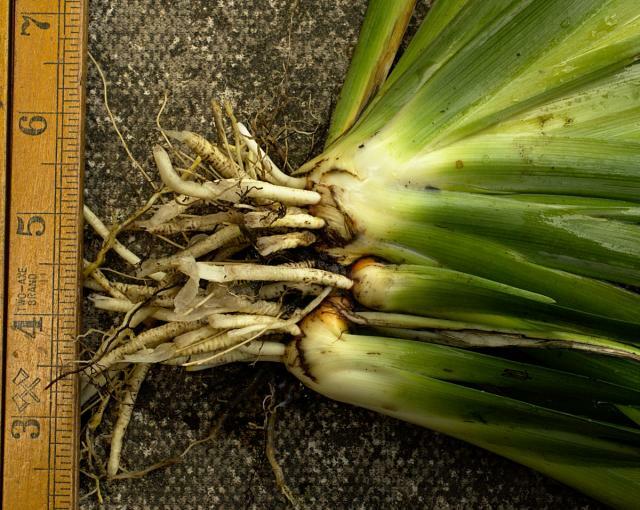 Iris collettii is similar to Iris barbatula except smaller in all parts. The flower is usually pale lavander or lilac with a yellow crest surrounded by a white signal patch. It is widely distributed in China and neighboring countries where it grows in different habitats: wood edges and clearings, shrubby areas etc. Photos were taken in NW Sichuan by Oron Peri. Iris dolichosiphon subsp orientalis is a small elegant alpine plant restricted to high elevations in Yunnan and Sichuan provinces. Photo was taken in Sichuan at 4900 m by Oron Peri. 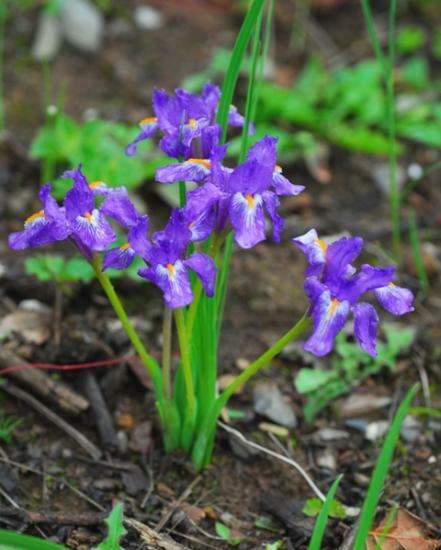 Iris ensata is a plant from eastern Asia (Japan, China) with purple or reddish purple flowers. There have been hundreds of selections made including white and bicolors, all veined and with spotted falls. Many flowers are very showy. 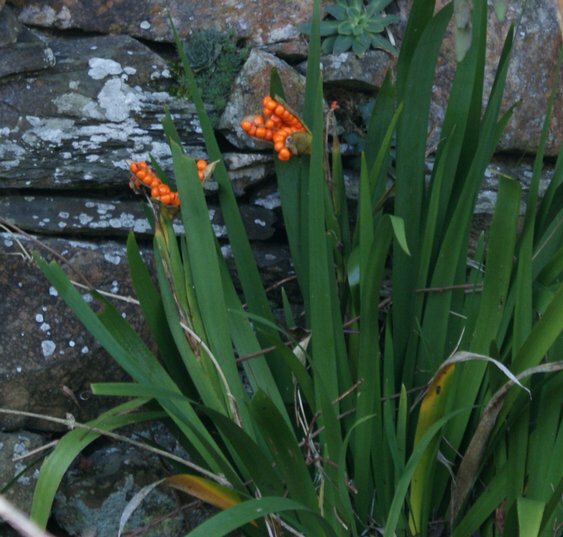 These plants are often grown near water. 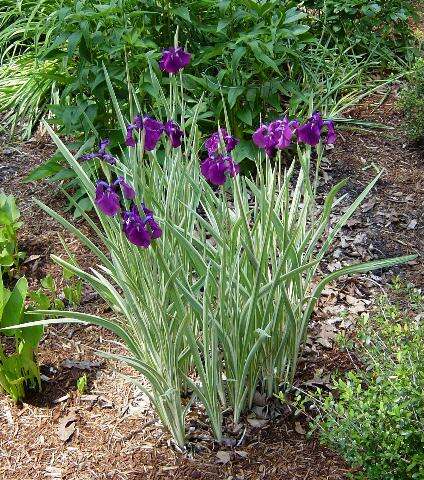 This is known as Japanese Iris and it enjoys damp, rich, acidic soils and full sun. Iris ensata 'Variegata' - Most of the named cultivars of this iris have very large showy flowers, but this variegated form has flowers that are closer to the wild forms. The foliage is the main attraction and remains beautiful throughout the growing season. Photo by Jay Yourch. 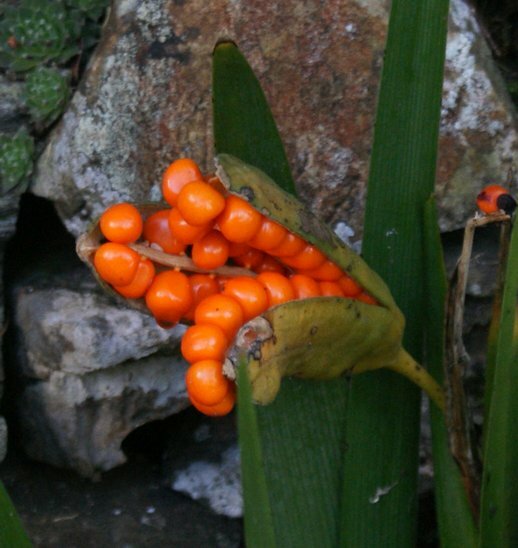 Iris foetidissima is the only species in the Series Foetidissimae. 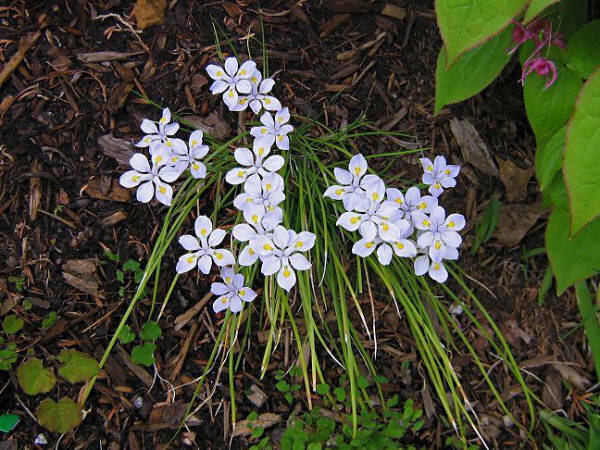 These have a tough almost woody rhizome, evergreen foliage and mostly bland pale and insignificant flowers. Some selections have more attractive well colored flowers, but the plants are often grown because they tolerate a good deal of shade and produce large seed pods filled with bright red seeds that spill from the pods when ripe in autumn. Some selections have yellow, orange or white seeds. 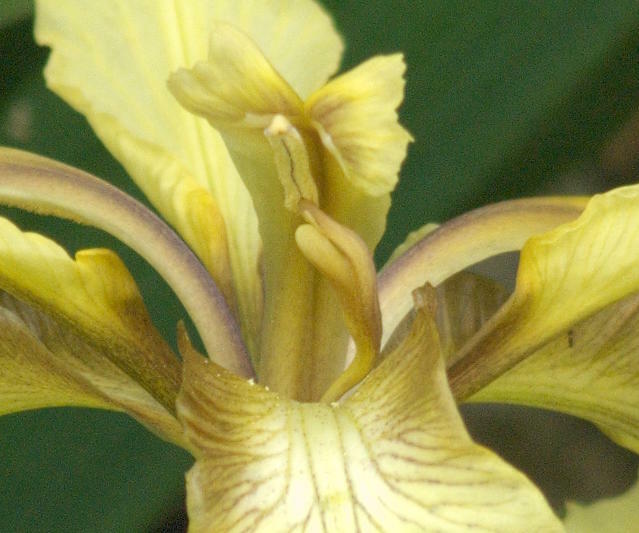 Common names include Stinking Iris, Stinking Gladwin, Gladdon, Gladwin Iris, Beef steak iris. It is native to Western Europe including the British Isles. The plentiful seeds and its robust nature ensure that once grown it is hard to get rid of, but it is not hardy in northern gardens. Despite the above list of common names a lot of effort crushing the foliage is required to generate any aroma. The leaf shown in the second photo is about 20 mm wide. The flowers are pictured in early June and the fruit at the start of November (photos 4-5) and mid December (photo 6). Photos by David Pilling. 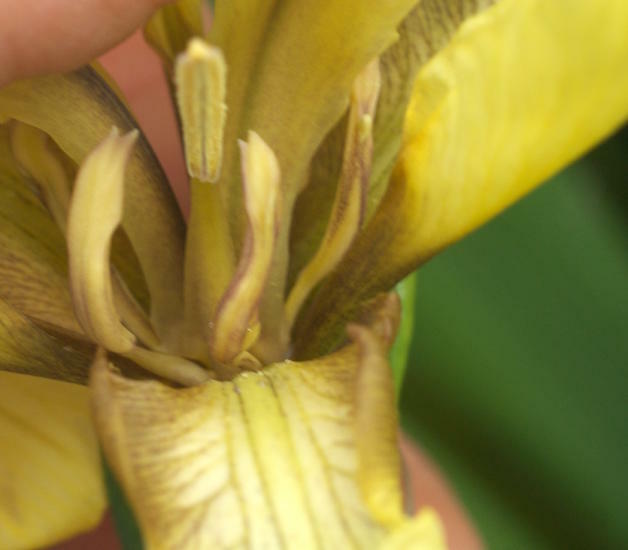 The first photo shows the proper appearance of a flower, the next two display additions that occur on some. 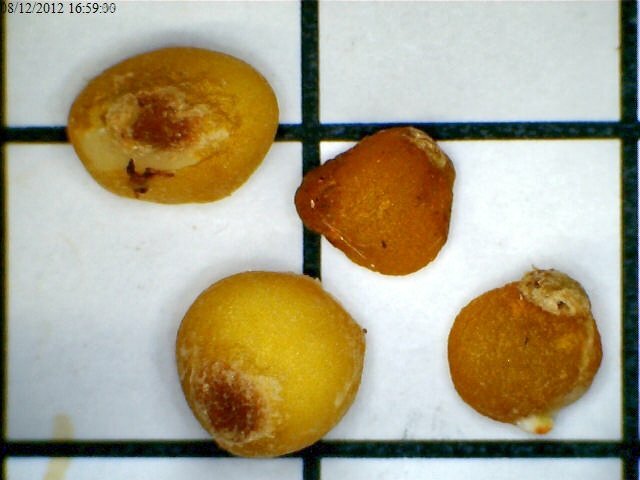 Photographs of seeds, the first photo shows seed on a 10 mm grid, in the middle are a dry seed and a seed with the flesh freshly removed. The second photo is of fresh and dried seeds on a 10 mm grid. 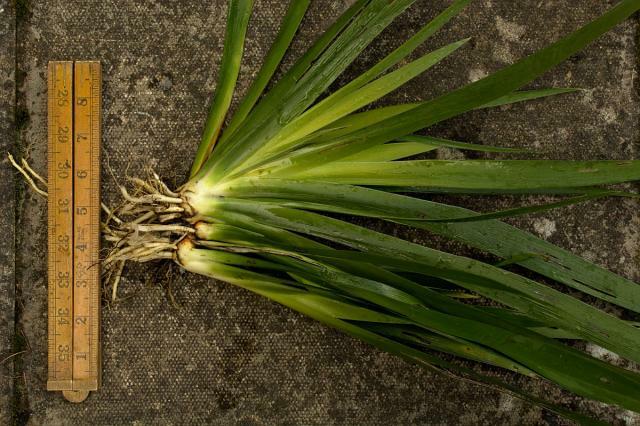 Photos 3 and 4 are of a complete plant; the ruler is marked in inches. 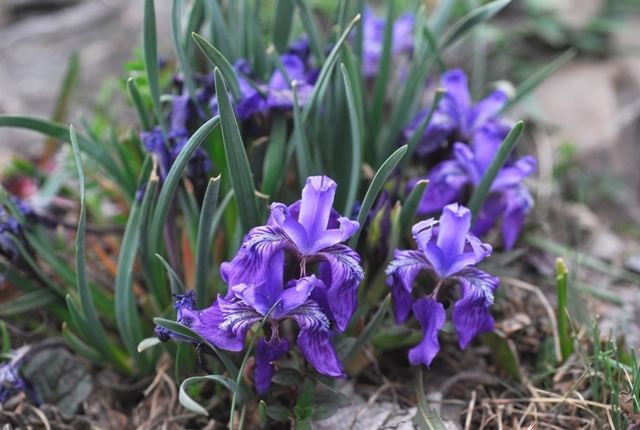 Iris graminea has a distribution which ranges from Spain, France, Northern Italy to the Caucasus. 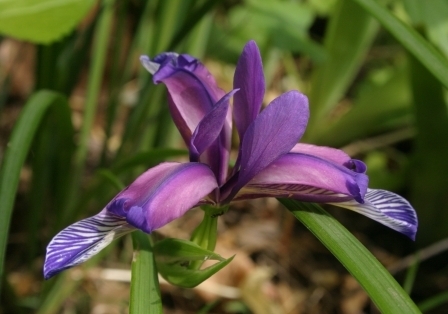 Although related to Iris spuria, it is a much smaller plant and for garden purposes has little in common with the large spuria cultivars. A plum-like scent is often attributed to the flowers of this plant, although the flower shown in the photograph had a wax-like scent devoid of floral or fruity qualities. Photos 1&2 were taken by Jim McKenney on May 17, 2006 in his zone 7 Montgomery County, Maryland, USA garden. In the first photo the white patches on the undersides of the falls are apparent. 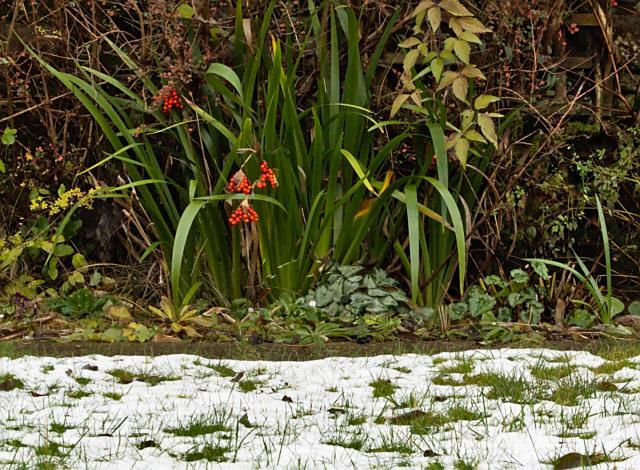 Third photo was taken in its habitat in Spain [Pyrenees] by Oron Peri. 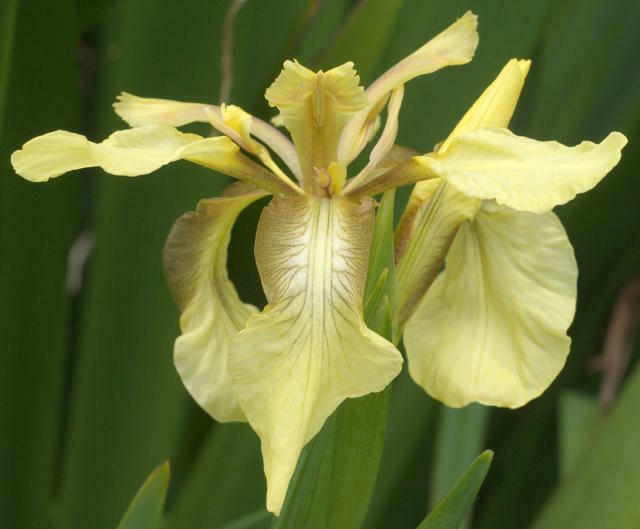 Iris halophila is distributed from China to eastern Europe, taking in Pakistan, Afghanistan and Mongolia. 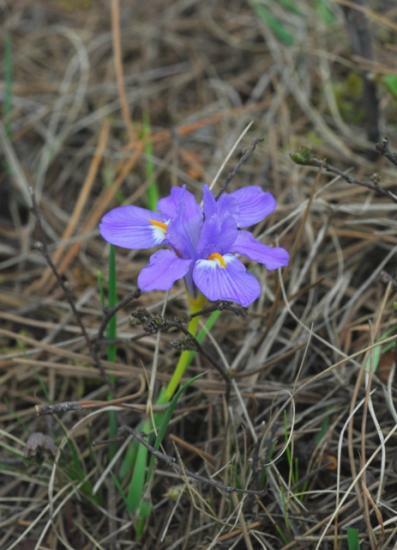 It was classified as Iris spuria subsp. halophila. 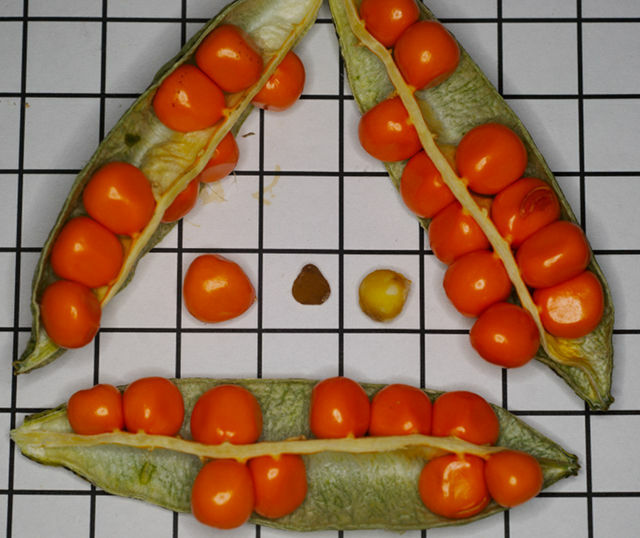 Seed photo David Pilling. Iris henryi - This rare Iris is a really choice little Chinese woodland species with very narrow grassy leaves and light blue flowers on 3" stems. Photos by Mark McDonough taken in May 2006. Each flower stem has two buds. 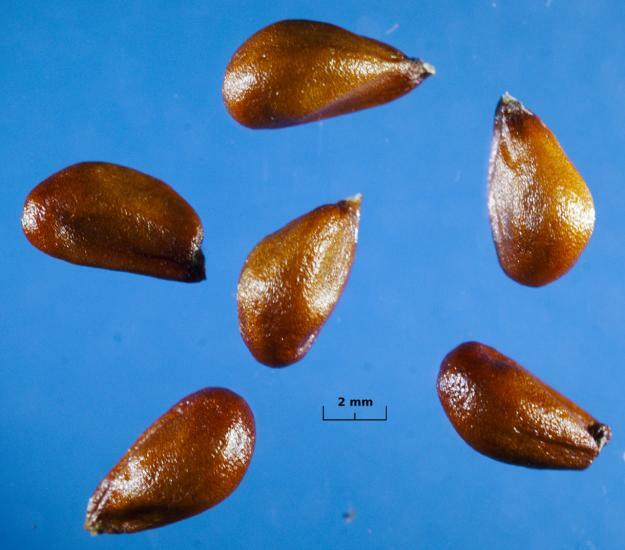 The second photo shows the developing seed capsules. 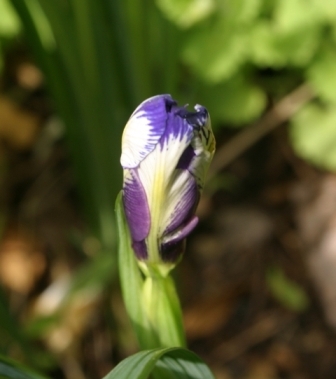 Iris hookeri - from the North East coast of the USA and Canada, related to Iris setosa. Seed photo by David Pilling. 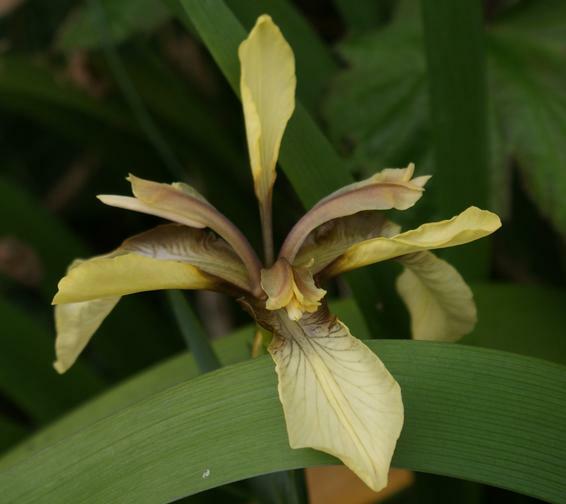 Iris koreana - from Korea, this is a dwarf, spreading Iris, somewhat like a yellow-flowered Iris cristata and suitable for similar woodsy conditions although taking sun too. One of Darrell's great introductions from his Epimedium nursery known as Garden Vision. Two photos by Mark McDonough.